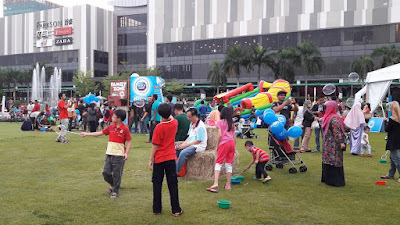 Mommy Jane brought Little Angels to Setia City Park, Shah Alam on Saturday, 26th November 2016 for FOX MOVIES AWESOME WEEKEND to enjoy fun activities, picnic in the park and movie screening under the stars ! Yes, under the star at an open area with large screen just in front of us. Organised by FOX Movies Premium and with the support of sponsors i.e. Dutch Lady, Sharp, Setia, Kinder Schoko-Bons Crispy and Renault together with their broadcast partner, Astro. the FOX Movies Awesome Weekend Event was organised in conjunction with the year end school holidays, to encourage everyone to go out and enjoy bonding moments together with our loved ones. Vineet Puri, VP Territory Head of FOX Sports (M) Sdn Bhd said that the weekend event was organized in conjunction with the school holidays. The school year is finally over and this is an opportunity for both parents and children to have great fun and enjoy free movie screenings under the stars. Thanks to their event sponsors and partners and all visitors who had an awesome time enjoying the fun activities throughout the weekend. Visitors from all age and ethnics joined together to enjoy the aplenty family-friendly activities such as Bungee Run, Kids Obstacle Course, Giant Bubble, Carnival Games and Character Face Painting to keep the younger children and their parents entertained while the older children tried out Zorb Ball, Assassin's Creed Virtual Reality experience and free-to-play games throughout the day. There are some Q&A sessions where everyone had a chance to win some VIP tickets, FOX Movies Premium's goodie bags, Sesame Street movie vouchers and lots more. My Little Angels played most of the games, answer the question and won some prizes too. Non-stop activities for the whole weekends and everyone were kept entertained by the Emcee of the event. At around 7.15 p.m., Mommy Jane and Little Angels purchased some food from the food trucks and went to the VIP area to be seated before our favourite movie, Rio started. Some of us sat at the comfortable bean bags provided at the area and some of us sat at the inflatable seat provided complimentary by FOX Movies Premium. It was comfortable and windy as we sat to enjoyed our favourite movie while having our delicious meal under the star. Some families even brought along their mat for a picnic with their family and friends enjoying the big screen movie. After the movie, Rio had ended, the Emcee arranged some games and Q&A for all the participants to win some limited merchandise before announcing the lucky draw winners. There are 2 winners on both days that went home with a SHARP AQUOS 60" Powered by Android TV each. 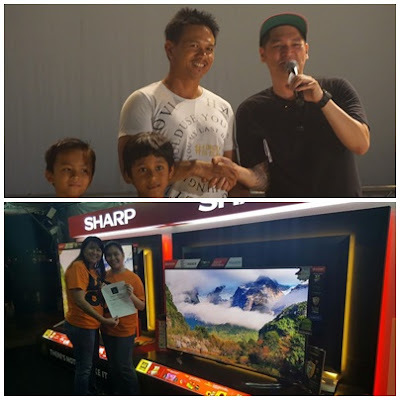 On the first day, a father with 2 children and on the second day, my friend, Jasmine Tan who saw my post, went there with her family and brought home the 2nd TV. After the lucky winner announcement, the we was presented with another mega blockbusters and pleasers, Avatar. On Sunday, the crowd enjoyed watching Kung Fu Panda 3 and Kingsman. 1. Creed - 3 December at 10 p.m.
Sylvester Stallong starred as the former World Heavyweight Champion Rocky Balboa, playing trainer and mentor to the son of his late friend and former rival Appollo Creed. 2. Star Wars Day - 17 December fron 8 a.m. Grab your lightsabers and choose a side because FOX Movies Premium is bringing back all six episodes of the Star Wars saga leading up to the premier of Star Wars: The Force Awakens on 17 December at 10 p.m.
3. The Revenant - 10 December at 10 p.m. The Academy Award winner, Leonardo DiCaprio plays legendary explorer Hugh Glass in battling against all odds and enduring unimaginable grief to survive a relentless winter in uncharted terrain. 4. Elstree 1976 - 12 December at 10 p.m. Successfully funded via kickstarter, Elstree 1976 is a documentary film about the making of the original Star Wars film and the legacy that it left behind. Actors and extras reminisce about their time on the set of Star Wars and how making the film affected their lives. 5. Snoopy and Charlie Brown: The Peanuts Movie - 24 December at 10 p.m.
A character by Charles Schulz in his comic strip, Peanuts and possibly the world's most famous beagle, Snoopy embarks upon his greatest mission as he and his team take to the skies to pursue their arch-nemesis while his best friend, Charlie Brown begins his own epic quest to win the love of his life. 6. Alvin and the Chipmunks: Road Chip - 25 December at 10 p.m. The 3 signing, animated anthropomorphic chipmunks, Alvin, Simon and Theodore come to believe that Dave is going to dump them after he successfully propose to his new girlfriend in Miaimi. The drama and adventure ensues as they attempt to get to him and stop the proposal... which was all a misunderstanding. 7. My Big Fat Greek Wedding 2 - 26 December at 10 p.m.
A sequel to the saga of Toula Portokalos-Miller (starred by Nia Vardalos), a family secret brings the beloved characters back together for an even bigger and Greeker wedding. 8. Joy - 31 December at 10 p.m.
Jennifer Lawrence plays Joy, a hardworking young girl from a half-broken family who ultimately grew to become its shining matriarch and leader in her own right. FOX Movies Premium and FOX Movies Premium HD is dedicated to provide its first-run and exclusive content through an unmatched entertainment experience. From Hollywood blockbusters to all-time movie classics, FOX Movies Premium brings you everything that you want and more. Do check out the official Facebook page of Fox Movies Premium at www.facebook.com/FOXMoviesPremium for more updates and movie highlights. Thanks to FOX Movies Premium and all the sponsors for organising such a great event for the whole family especially during this School Holiday. Me and my Little Angels had enjoyed ourselves so much with the complimentary activities, games and the movie treats under the Star with large screen just in front of us. It was indeed a memorable and great place to spend on that weekend. It foster bonds between us as we enjoyed the special moments together as family. If you want to know about their upcoming events, do follow them at their Facebook page to get all the latest news and on their upcoming movies too. good event for the whole family. Congrats to the winners so lucky! Rane, indeed it is. We love it so much till we went again the next day. Cool! I'm sure the kids really had fun! Perfect bonding moments for families. Jona, really fun and all these activities are free. Mommy save a lot while children had unlimited playtimes. I wish I was a kid all over again...i would love to roll around and have fun at places like this! Yana, me too. Kids nowadays are really lucky. The event looks so fun! Pretty sure you guys sure had a lot of fun there! Shini, it is indeed fun. The area was big enough for children to run around happily. Ivy, you're most welcome. Hope we able to join them next round again. different kind of event for the families and kids. seems fun! Qian, the event caters for all age. Family had a great bonding session here. If only this was near to our house. hahah. i hope you really had fun! Great! such a good outing activities for the whole family. Watching movies is perhaps the greatest pastime of the world. It is a hugely popular pastime that solar movies practically the entire world hooked on to it.